Austin – As state leaders debate restoring funding for children’s therapies, a new report by Texans Care for Children shows that the number of children receiving Early Childhood Intervention (ECI) services is lower statewide and in North Texas compared to 2011. A combination of state cuts to ECI funding since 2011 and more recent state cuts to Medicaid reimbursement rates for children’s therapies has contributed to an overall reduction in the number of children served, the closure of ECI programs, and financial strain on community organizations providing ECI services, although enrollment numbers have begun to rebound in recent years both statewide and in North Texas. 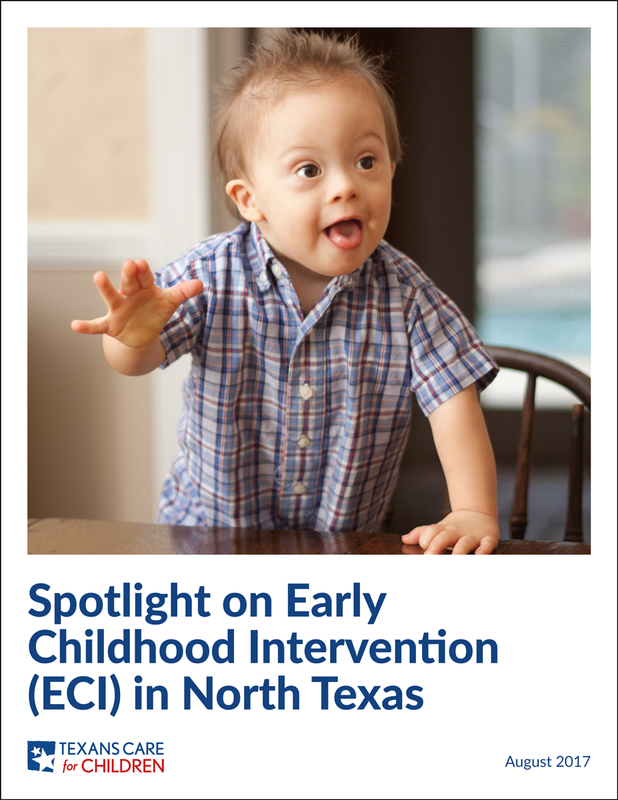 The report builds on Texans Care for Children’s 2016 report on ECI, providing an update on statewide developments and zeroing in on the North Texas region composed of Collin, Dallas, Denton, and Tarrant Counties as well as 15 other less populated counties. Support for this report was provided by the Harold Simmons Foundation. Under the state-federal ECI program, the Health and Human Services Commission (HHSC) contracts with 47 community organizations to provide coordinated services to children under age three with Down syndrome, speech delays, autism, and other disabilities and developmental delays. In North Texas, ECI contractors include ECI of North Central Texas (operated by MHMR of Tarrant County), ECI of Metrocare Services, the Warren Center ECI, and others. The Texas Legislature has undermined ECI through two funding sources. First, direct appropriations for ECI have fallen from $166 million in FY 2011, the year before state cuts were enacted, to $148 million in FY 2018. During the 2017 regular session, legislators increased ECI appropriations compared to the previous biennium but fell short of fully funding anticipated caseload growth. Second, the 2015 Legislature reduced Medicaid reimbursement rates for children’s therapies, affecting ECI contractors as well as private health agencies that serve children of all ages with disabilities. The Legislature restored 25 percent of that Medicaid funding during the regular 2017 session. The House unanimously passed legislation during the recent special session to fully restore the funding, but the Senate declined to take up the legislation and the Governor declined to add it to the special session agenda. ECI enrollment has fallen statewide and in North Texas since the Legislature enacted funding cuts in 2011. Although the population of young children has grown in the state and the North Texas region, the number of children receiving ECI services fell 10 percent statewide and 12 percent in North Texas from 2011 to 2016. Overall enrollment in the 19-county North Texas region fell from 15,032 in 2011 to 13,199 in 2016, a decline of nearly 2,000 children. North Texas counties with significant enrollment declines include Dallas (22 percent), Collin (35 percent), Denton (18 percent), Grayson (22 percent), Kaufman (38 percent), Rockwall (29 percent), Navarro (31 percent), Hood (17 percent), and Fannin (24 percent). As noted in Figure 6 in the report, the population of children under three rose in some of the counties and declined in others. State funding cuts contributed to the reductions in enrollment by pushing some ECI contractors to close down, causing remaining ECI contractors to scale back “Child Find” outreach efforts, and undermining ECI in other ways. Enrollment declines have hit all demographic groups, but the largest decline is among Black children, both statewide and in North Texas. Despite a relatively large increase in the population of Black children under age three in the state and North Texas region, enrollment of Black children in ECI fell 30 percent statewide and 22 percent in North Texas from 2011 to 2016. Hispanic enrollment also fell disproportionately in the region and the state. Closure of ECI programs across the state and in North Texas have hurt enrollment. Between 2009 and 2014, four ECI contractors closed down their ECI services in North Texas, leaving seven contractors in the region. Looking at the statewide picture in recent years, three organizations withdrew from the state ECI program last year (in El Paso, Tyler, and Wichita Falls) and three notified the state in recent months that they are withdrawing this year (in the Brazos Valley, Galveston, and the Hill Country). In North Texas, ECI enrollment has fallen more sharply in counties that lost contractors, including Collin, Dallas, and Denton Counties. Even when the state quickly identifies a new contractor to replace a closed down program, the report shows there are gaps in services and a decline in enrollment after closures due to the time required to hire qualified staff, communication challenges with families, and other factors. Despite the overall decline in ECI enrollment, the continuing financial strain on contractors, and the recent closures, there is also good news statewide and in North Texas. Between 2015 and 2016, enrollment increased five percent statewide and nine percent in the region, in part reflecting the increased population of children under age three. Tarrant County is the region’s one large county to experience an overall increase in enrollment since 2011, with a rise of five percent. It is also the one large county in the region that has not experienced a closure since 2009. Eight smaller counties in the North Texas region also increased their overall enrollment since 2011. Ensure that existing ECI contractors have the financial and other resources they need to remain in the ECI program and be financially sustainable, including adequate and timely mid-year funding to cover enrollment beyond their contracts. Fully reverse the Medicaid therapy rate cuts enacted in 2015. Utilize the state’s ECI advisory committee to assess and recommend options to strengthen the ECI program, boost Child Find efforts, reduce administrative burdens on ECI contractors, and improve transitions following closures. Evaluate and address the causes of the disproportionate decline in ECI enrollment of children of color. Fully fund Medicaid, CHIP, and IDEA Part C.
Maintain protections for children in Medicaid, including EPSDT. Maintain IDEA requirements for states to provide early intervention services to all eligible children under age three. Build on successful local efforts to improve community coordination and outreach regarding developmental screenings, ECI awareness, and ECI enrollment.